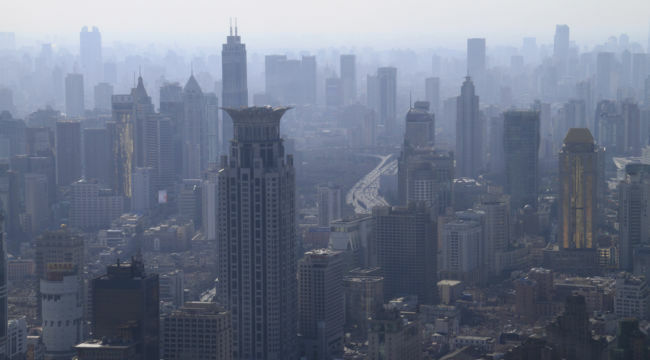 For years, China has been struggling with a terrible air pollution problem. The country has seven of the ten most polluted cities on the planet. The reason for the problem is the country’s heavy reliance coal as an energy source. I’m sure you have seen pictures like the one below that shows people literally choking on the air. But for Chinese residents, the summer of 2018 has offered a breath of fresh air — actually several months of fresh air. 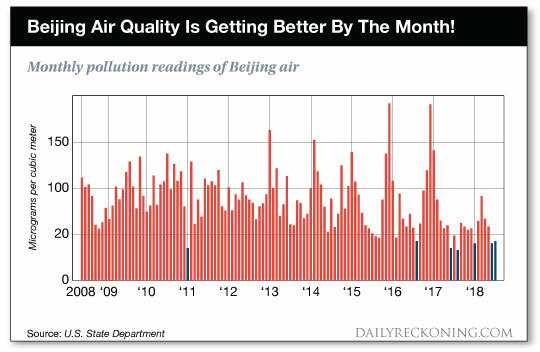 China’s air pollution problem has started to improve thanks to the aggressive anti-smog plan President Xi Jinping had the country embark on. The core of that plan involves moving China’s energy production away from coal and towards natural gas. When used for power generation, natural gas is by far the cleanest hydrocarbon. Natural gas emits as 50% less carbon dioxide than coal while generating virtually no sulfur dioxide, nitrogen oxides, mercury or particulates, all of which are undesirable side effects from burning coal. For China — and the many other developing world nations following their lead — natural gas is the no-brainer option in the future. And it will have huge implications on the amount demanded going forward. The natural gas demand story all starts with China, but it most certainly doesn’t end there. That 145 billion cubic feet per day figure is an absurdly large increase that will be very difficult — if even possible — for the global energy industry to meet with enough supply. What complicates the story further is that the heavily populated countries like China and India, where natural gas demand is surging, are not blessed with an abundance of natural gas reserves. These countries are not going to be able to come close to supplying their own needs. That means that China and India are going to need to import much of the natural gas that they will consume… which presents a buying opportunity for savvy investors. Shell is currently working towards finalizing a decision to begin construction of a $40 billion liquefied natural gas (LNG) facility in Northern British Columbia, Canada. This LNG facility will take natural gas and cool it to the point where it becomes a liquid. This process will allow the commodity to be safely shipped across the globe — more specifically to Asia where it can be sold at even higher prices. This project is called LNG Canada and it is huge. Once up and running, it will demand 3.5 billion cubic feet per day of Canadian natural gas. Consider that the entire country of Canada currently produces only 16 billion cubic feet per day. That means that LNG Canada alone will require the entire country to raise production by almost 22 percent. So how do we play it? Let’s keep it simple and take a look at Canadian Natural Resources (CNQ), the single largest producer of natural gas in Canada. Canadian Natural is doing just fine with natural gas prices where they are. The company currently yields over 3 percent, has a solid oil production business that diversifies operations and also has a rock solid balance sheet. Coupled all together, these make CNQ a great investment without a spike in natural gas prices. But If Canadian natural gas prices do increase in the coming years — like I expect them to — no company will benefit more than Canadian gas giant CNQ who will now be able to sell gas at higher prices. That’s the kind of risk-reward play I want in my portfolio. And I recommend you add it to yours.